Loved working with Hitasha. I had a vision in mind and from the first consultation through multiple tastings till the day of delivery, Hitasha was great to work with. She was very flexible and accommodating, worked with me to make my vision come alive while contributing her expertise. I even had some unique and new flavors that I wanted to incorporate and Hitasha trialed them out and had them ready for me along with her regular flavors during our tastings. We had 2 in person tastings and 2 "by mail" tastings, so she definitely made sure I knew what I was ordering! I had a wedding cake as well as a dessert bar supplied by Hitasha, and everything was delicious. She accommodated my dietary preference of making everything eggless (well all but the macarons, as that is impossible to make eggless). This was wonderful because many other bakers I had spoken with had either very limited selections for eggless or they would make it entirely vegan, which is not what I was looking for. Some examples of unique flavors I was able to incorporate into the dessert bar and cake spread included rose pistachio, lavender spice, pineapple mango, chocolate pecan caramel (aka turtle) and pina colada. We got a 4 tier cake with 3 flavors and 2 types of cupcakes (the cupcakes were part of the cake design/display), mousse and cheesecake shooters, macarons, chocolate covered strawberries, chocolate covered pretzels and cake pops. Hitasha hand-made the cake topper based on a design I had requested. The only issue we had was that the name cards with ingredients list for the dessert table got lost somehow after she dropped them off, but I was able to get my venue to hand write them on the spot, so not a big deal. I can't wait to meet up with Hitasha next year at our 1 year anniversary (yes, she will bake you a fresh top tier cake and then you get to hang out with her). Hitasha at the Cakery is AMAZING. I don't tend to give 5 stars across the board, but she truly deserves them! Her service is amazing. Always timely with her kind communication. You can tell she is passionate for what she does. Her consultation/tasting is awesome. She really wants to know what YOU want. So many yummy flavors. She even accommodated my gluten free needs! Beyond her service - her cakes! Awesome! The designs and the taste are top notch. We had a 4 tier cake with 3 different flavors. Not a single piece was left over and we got great feedback about the cake. Just wish that we kept more for ourselves! I would not hesistate with going with Hitasha. Her price point is fair and her cake is great! We would happily recommend her to anyone! Hitasha designed a beautiful four tier cake for our wedding, and it was absolutely amazing! 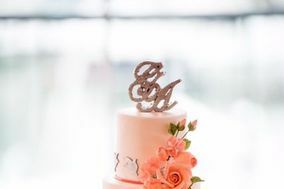 Not only does she have tons of great and unique flavors to choose from, but the cake design looked so regal and elegant! You will not regret selecting her for your big day. thanks to Hitasha for making my wife's baby shower so special .. She not only made a delicious beautiful cake , cookies , cake pops but also helped in decorating the cake table adding to the over all beauty of the hall.. Highly recommend her.. I was online searching for a cake vendor about a week and half before my wedding; had a whole venetian hour set-up but figured a cake would be nice for the cake cutting ceremony, so was desperately calling around! Hitasha was super responsive and got back to me right away with design, pricing and flavor list. The flavor list is pretty extensive and she was able to create a design for me based on my reception decorations/colors/likes. The cake was delivered the day of with no issues and she was able to incorporate both flavors that me and my fiance had wanted in seperate tiers. It was tasty and beautiful! would recommend any bride who is looking for a cake vendor and looking for a stress-free process. Hitasha was great to work with. She is very professional and great at what she does. We didn't see the flavor of cake we wanted on her list and she made the flavors we wanted for our cake tasting. Her sugar flowers are amazing!!! Everyone thought they were real flowers. I also loved that she made a little sugar English Bulldog for our cake. It was so nice to feel like our dog was still a part of the wedding even though she couldn't come. The cake tasted so good. My only regret is that my parents have all the leftovers. I had The Cakery make my baby shower cake in September 2013 and my dad's 60th birthday cake just recently. Both cakes were completely different, yet executed brilliantly by Hitasha. Baby shower cake was a sculpted baby carriage with blue pearlized fondant and white sugar flowers. The birthday cake was 3 tiers with beautiful orange sugar flowers. Not only do the cakes look elegant and professional, they taste great. Hitasha uses real ingredients, mango, rose, almond, etc, and only the best quality, premium fondant that actually tastes great. The red velvet is the best one I've ever tasted at any bakery! Don't bother researching other bakers who use box cake mix, artificial flavors, and cheap ingredients. We got our wedding cake from The Cakery Bake Shop and it was spectacular. Right from the first meeting we had, when we went in for a tasting, we knew this was going to be our choice. Hitasha, really took an interest in the details of our wedding, the decor, the outfits, everything down to the wedding card itself. She really put the whole wedding story together and brought it out in her design. We didn't see the finished product till they rolled it out at the reception. We trusted her ability, so we wanted to be surprised. Let me tell you, we were blown away, as were all the guest. Everyone has been asking us where we got it made. Thank you so much for all your hard work. You really helped make our wedding very special and enchanting. To anyone looking for a wedding cake, go to The Cakery and don't look any further, because you won't beat it. We ordered our Wedding Cake from The Cakery. The execution of the wedding cake was flawless. The first thing all our guests noticed in the reception's dim room was the cake. I heard 'oohs' and 'ahhs' throughout the wedding. The cake designer listened to my ideas of having a subtle victorian design and embraced the challenge. The result was an elegant production. The quality of the cake and icing was even better than the taste test. Everything was made from scratch and real ingredient. Loved the fondant!Thank you H! You made our day very special! Now I'm looking for a reason to order another yummy cake! Hitasha at Delicious Delights delivered an AMAZING wedding cake that blew us away! She was so fun to work with throughout the wedding planning process and had a lot of great ideas to help make our cake match our theme, colors, and the overall feel we were going for. Her cake was just as delicious as her cupcakes (which we couldn't get enough of during the tastings! )...better book her now before she gets too busy!! Thank you Delicious Delights for your hard work and creativity, and best of all, a gorgeous and tasty-as-heck cake!! Hands down the best customer service I have ever experienced. People working at Delicious Delights sure know what they are doing. I called them for my 25th birthday cake, told them I liked Red Velvet but also wanted to try something else and they suggested Strawberry-Vanilla. At first I wasn't sure about it but the combination went seamlessly. All I can say is that after the party was done I wished there was some cake left over. I loved working with Hitasha! I called her out of the blue to make something random- wanted to make Russian Dolly Cake pops fashioned after something I saw in a UK Bridal magazine. She did an amazing job, was by far best of the 15 vendors I sampled, which is why I thought it was even more amazing that she was the cheapest! I have used her for several professional events since and she knocks it out of the park every time. Thanks, Hitasha for making my wedding cake pops the talk of the town! Great service and great product. I loved working with Delicious Delights! I highly recommend their services and their products! But just to clarify, I ordered a cake for a Graduation Party, not a wedding. However, the Delicious Delights cake was truly wonderful!